When we shift the seasons, it’s easy to feel overwhelmed, isn’t it? Yet, it’s also the time of year when we are invited to stop and remember our blessings. A gratitude practice is one of the best ways to deal with feeling overwhelmed and stressed out. 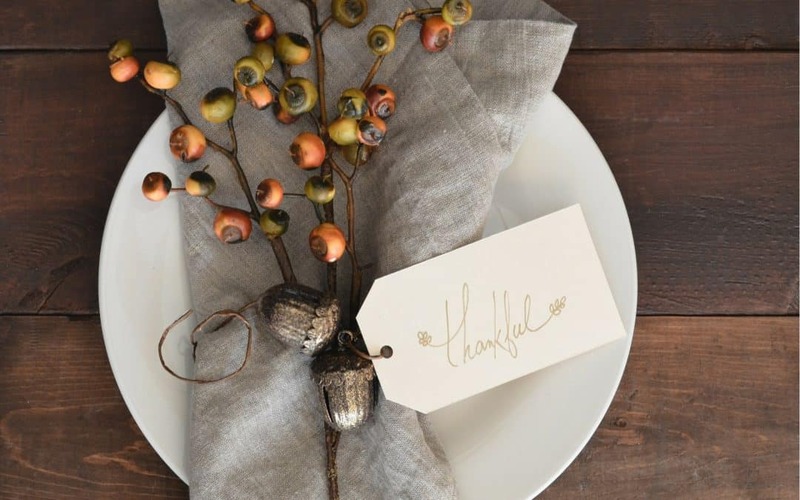 I’m sure you’ve heard it before, but gratitude isn’t just a dish served on Thanksgiving. No, darling, an active gratitude practice can help you re-wire your brain and support you in creating a life that you love. Once November is over, though, most folks will stop creating Facebook Status posts about gratitude (and likely go back to feeling a little less joyful). While Brene Brown was researching for her book The Gifts of Imperfection, she discovered that it wasn’t that happy people were grateful; she found that grateful people experienced more joy. I found that fascinating because, any time I’m feeling off my game (aka cranky or irritable), a curious review of my actions usually unearths the fact that I’ve gotten “too busy” in my practice of gratitude. Like you, I get off track. I struggle with doing the very things I need to do in order to best support myself. So instead of beating myself up, I get back to gratitude. In addition to simply being too busy or out of the habit of gratitude, I realized that it’s easy to lose sight of the actual practice of gratitude and allow the process to simply become a rote-action of checking off a list of things you’re supposed to do. Here are nine ways to get back to gratitude in your life. Use this as a jumping off point and tailor your practice to what feels nourishing and supportive. In the morning as your brush your teeth, brainstorm all the things you’re grateful for. You’ll feel much more focused than going over your to-do list. So, as you polish your pearlie whites, infuse your morning with gratitude. The preparation of my first cup of coffee is like a prayer that connects me to the sacred part of myself. Create a ritual within the first hour of waking. You’ll feel more grounded (and naturally grateful) than if you’re just rushing around. Create a visual gratitude journal of sorts with your Instagram account. Vow to photograph at least one moment of your day, and then examine that photo for what it shows you is fabulous in your world. Buy a package of 3×5 cards and stick some in your desk, in your purse, in your kitchen, in your nightstand and other places you find yourself. Put a favorite pen with each stack and Voila! Instant gratitude recording devices. At the end of the week, gather all of your cards and tape them into your journal. I love the “happiness” jars that folks are doing. Put a big jar (or bowl) in the kitchen with a sign that says “Joy Jar”. Invite your family to write about their joys and gratitude on slips of paper and toss them in the jar all month. Read them together on Christmas or New Year’s. I love using beautiful journals. I’ve switched to using the Leuchturm1917 notebooks. After shelving the old journal, I tuck favorite magazine photos or quotes throughout the journal. Then, it’s like an instant joy when I come upon one of these pages. Do this for yourself as a gift. Do this for your best friend. JB and I have a little ritual where, over dinner, we share with each other the best part of our day. Yes, we have those days where the highlight is “coming home”, but that’s a part of the ritual of our family dinner. Instead of only focusing on our victories on rare occasions, what if we celebrated daily? Together. Over a meal. Outloud. The lighting of a candle is like a little prayer. There is magic in the flicker of a candle. Buy a candle that smells amazing to you. (it doesn’t have to be expensive, I’m kind of loving the Glade Pumpkin Spice Candles these days). As you light it, say a prayer of gratitude. Every time you gaze on the flame, allow gratitude to wash over you. Remember the old “Count your blessings instead of sheep” song? They had the right idea on how to have sweeter dreams. Keep a journal or stack of 3×5 cards by your nightstand and before you turn off the light, write down at least three things you’re grateful for that night. It’s seeding your dreams to be supportive and positive. These are just a few ideas on how to make gratitude a daily part of living. I’d love to hear your ideas for practicing gratitude. Because, isn’t it time we carried the feeling of Thanksgiving throughout every day of the year and not just a Thursday in November? Want to seed gratitude into your daily life? Choose a Word of the Year! I know that this is a “busy” time of year…yet I also know that if you are here, you desire to have a nourishing daily life. This eBook / workbook is designed to help you with that. In Part One, you’ll review a list of more than 1000 words and begin pondering what Word (or words) is right for YOU in 2019. Take a look back in Part Two, as you Bid Farewell to 2018. Look ahead to 2019 in Part Three and begin to breathe life into your desires. Part Four provides you with a series of tools to help you gain clarity around the best Word to nourish and guide you for your journey through 2019. In Part Five, you’ll Declare Your Word (or Words) of 2019. I’ve also added a Bonus: Ways to Work with Your Word of the Year. 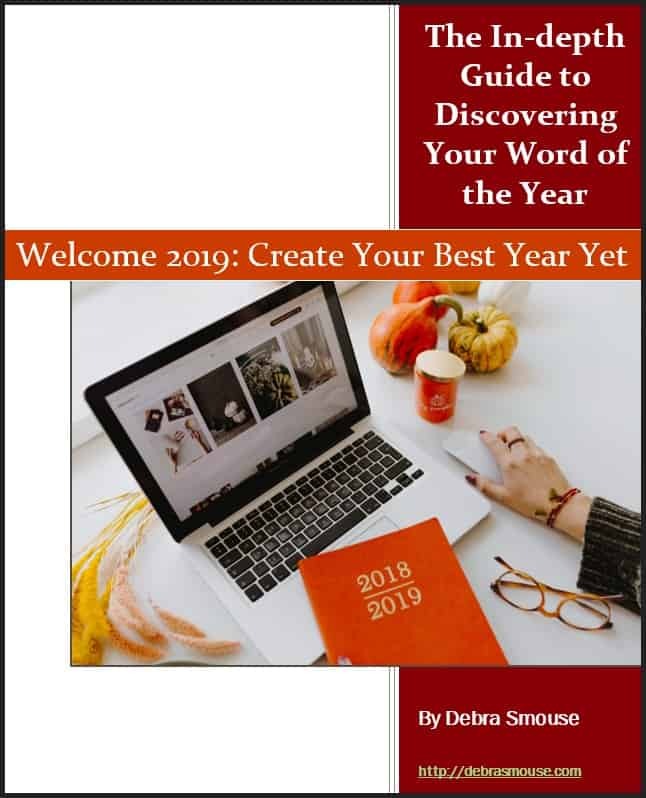 This section suggests a dozen ways to help seal your Word…and more than a dozen journal prompts to continue to check-in with your Word throughout 2019. Never forget that you deserve to create a life you love. I can’t wait to hear your Word of the Year for 2019 to guide you on your journey of creating your best year yet. Want to read more tips on how to love your life? Click here!